Again this week, we had one of our loyal subscribers send us a copy of a competing Windows newsletter who sent a special email to subscribers offering a “special deal” on a system information tool for $9.95 . Well that’s great, but since there are free system information tools that do the same things and provide the same information, were they doing their subscribers a favor – or were they taking advantage of their subscriber’s trust? It’s one thing when you offer your subscribers a great deal on a program that is worth it, but there are many free programs which can give you detailed information about your computer. So why would you recommend anyone pay $9.95 for a program when there are programs which work as well – and don’t cost a thing. There are certain programs which have no free counterparts – for instance no free antispyware can do what SUPERAntiSpyware can do – and independent tests show that to be true. There are free registry cleaners, but none work as well as Registry Commander – and some free registry cleaners can really cause BIG problems with your computer. If we found a free antispyware program or a registry cleaner that worked as well as the ones we sell, we’d tell you about them. You know why? Because we believe in you and we know you’d support us in other ways. The most valuable thing we have is your trust and we’ll never knowingly violate that trust. So we’ll save you $9.95 and tell you about two free programs that will give you detailed information about your computer – your motherboard, your processor, the temperature of your processor, the temperature of your motherboard, your video card, your sound hardware, and many other details you probably never knew – and some of which you can’t find in Windows. The first free system information program is the venerable Belarc Advisor. It’s still free and it’s still works great. It gives you all the information about your computer you’ll ever need – and it even lets you create a page showing complete details about your system. “The Belarc Advisor builds a detailed profile of your installed software and hardware, network inventory, missing Microsoft hotfixes, anti-virus status, security benchmarks, and displays the results in your Web browser. All of your PC profile information is kept private on your PC and is not sent to any web server. Operating Systems: Runs on Windows 7, 2008 R2, Vista, 2008, 2003, XP, 2000, NT 4, Me, 98, and 95. Both 32-bit and 64-bit Windows are supported. Browsers: Runs on Internet Explorer, Firefox, Safari, Opera, and many others. Belarc Advisor Works on Windows XP, Vista and Seven – 32bit and 64bit. “What’s in your computer? If you’re like most of us, you can probably name the processor (Intel or AMD, Celeron or Pentium), maybe how much RAM it has, and maybe how big the hard drive is. Two or three years later, when it comes time to upgrade your computer, that tag or sticker may be long gone. Speccy was designed as a free electronic “what’s inside” sticker for your PC. Isn’t this information in Windows? Yes and no. Some of the basic information can be found by right-clicking My Computer and then clicking Properties. The General tab lists some statistics, and the Device Manager on the Hardware tab lists all of the hardware you’ve got installed. But it misses out lots of information that you need. Speccy will give you detailed statistics on every piece of hardware in your computer. Including CPU, Motherboard, RAM, Graphics Cards, Hard Disks, Optical Drives, Audio support. Additionally Speccy adds the temperatures of your different components, so you can easily see if there’s a problem! Why do I need Speccy? If you’re going to be selling your PC, you can use Speccy to quickly list out the components. Or, if you’re buying a PC, you can use Speccy to check that the computer has what the label says it has. Well, we can’t add much more to that! We tested Speccy and it has a much more modern interface and it provides a nicer user experience than Belarc – but when it comes to formatting a printable output, Belarc provides a more nicely formatted printable page. 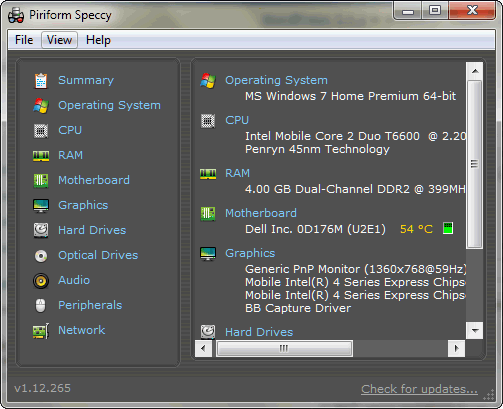 Speccy works on XP, Vista, and Seven – 32bit and 64bit.